Star Line Ferry was started by Tom Pfeiffelmann, Sam McIntire, and others in the late 1970s. They purchased Argosy Boat Line. The company was then renamed Star Line after the 5 original stockholders making up a 5 pointed star. At that time they operated slower ferries including the Nicolet, Treasure Islander and Flamingo. In 1979 Star Line bought their first fast ferry, Marquette. Over the next few years the old LaSalle and Nicolet were replaced with sisters to the Marquette. In 1987 Star Line decided to take it up a notch with Radisson, an 85-foot fast ferry which was modeled after a luxury yacht. In time the LaSalle, Nicolet, and Marquette also added hydro-jets with their trade mark rooster tails. In 1990 Star Line added Cadillac and in 1993 added Joliet. These boats were built in the style of the Radisson. In 2005, Marquette was sold to Davis Park Marine of Patchogue, NY. She was replaced by the larger Marquette II. And in 2006, Nicolet was also sold to Davis Park Marine. Built in 2005 and named after Father James Marquette, founder of Sault Ste. Marie in 1688 and St. Ignace in 1671, this is Star Line’s newest vessel. 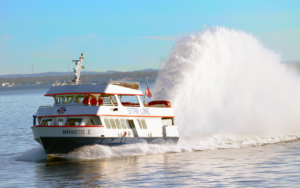 This vessel has three engines and a capacity of 330 passengers. Built in 1993 and named after French-Canadian explorer and geographer Louis Joliet. Joliet met Father Marquette at Sault Ste. Marie in 1669 and spent the winter of 1672-73 in St. Ignace. Capacity of 150 passengers. Built in 1990 and named after Antoine Cadillac, who as the commandant of Fort de Baude in St. Ignace, supervised all forts in the area. Cadillac did extensive writings about the area as well as the life and customs of the Indians. Capacity of 150 passengers. 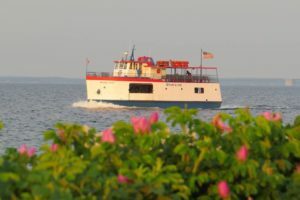 Built in 1988 and named after Pierre Espirit Radisson who spent much time exploring Lake Superior and Michigan’s Upper Peninsula. Radisson also helped found the Hudson Bay Company. This vessel has four engines and a capacity of 350 passengers. Built in 1983 after Robert LaSalle, explorer of the Mississippi River all the way to the Gulf of Mexico. LaSalle came to St. Ignace in 1679 aboard the Griffin, the first ship to sail the Great Lakes. This was Star Line’s first Hydro-Jet. Capacity 150 passengers. Named after Star Line board member “Anna May Timmons.” Purchased by Star Line in 2012, refurbish and put back into service in 2014. She is certified for 24,000 Lbs. freight and 150 passengers.